First I need to explain some things that are happening more and more recently. Just like most of the Internet the Wanderlodge Owners Group Forum is not immune to attempts at being accessed by spammers and hackers, despite our increasing safety measures additions to the forum at trying to prevent these attempts they are getting smarter at finding ways around the devices that we have in place, but so far we have been successful on preventing this from happening. We use all of that information to verify that you are indeed the member requesting the information, there is no need to include your password as once you recorded your password and saved the information in your profile, the forums software encrypts the password and it is then no longer visible to us, so it is important that you save all of this information in a safe place for future reference, don't rely on your memory to recall this information. 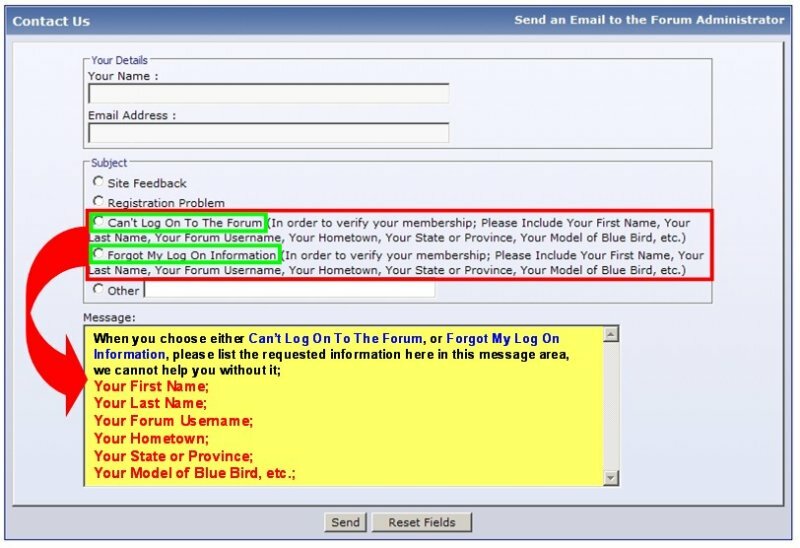 Finally make sure that you are sending this request for help through the email address that you have listed in your profile, using another email address will throw up a big red flag to us and may even result in your membership having limited access to the forum, until we can resolve the problem, which sometimes will take a phone conversation to resolve the problem. Please help us so that we can help you. Almost on a daily basis we get communications through the Contact Us link found on the forum at the bottom of each page, we try to answer these inquiries as soon as we get them in a timely fashion, but when we receive one of them that asks for help in providing any of our members profile information or help in changing that information it is very important to provide the required information asked for on the Contact Us form for the reasons quoted below. Finally make sure that the email address that you have provided is one that will receive any replies from us about your issue, because we have replied to emails that sometime sit in the Contact Us area of the forum for weeks without a reply or any action on the forum by the member, leaving us with a feeling that they never received our emailed replies of a fix or a request for more information. Sometimes an application for a WOG membership requires additional information so there is an emails sent back to the applicant for this. Another thing that can help us is please sign your inquiry with a personal first and last name and a Username if possible, we are not mind readers, it is amazing how many inquiries we get with nothing but the problem the member needs help with, so help us help you.